The press conference for the upcoming summer action film “Veteran,” at CGV Apgujeong Wednesday, was a gathering of some of the most trusted names in Korean cinema. The film is helmed by Ryoo Seung-wan, the director behind “The Unjust” (2010) and “The Berlin File” (2012), and the cast includes veteran actors like Hwang Jung-min, Yoo Hae-jin, and Yoo Ah-in. “The two hours will just fly by because you’ll enjoy the actors so much,” Ryoo said. 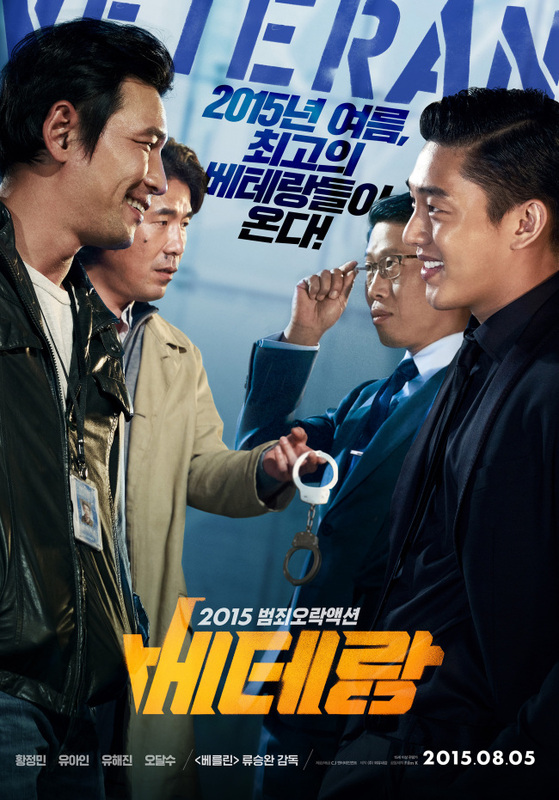 “Veteran” is about a Special Crime Squad of veteran detectives that goes up against the third-generation heir of an all-powerful conglomerate group. Hwang Jung-min plays a choleric detective who will stop at nothing to crack a case, while Yoo Ah-in plays the cocky and untouchable heir Cho Tae-oh, served by his trusty right hand, a ruthless executive surnamed Choi played by Yoo Hae-jin. The cast is made up of tried and tested combinations, such as Hwang Jung-min and Oh Dal-soo of the blockbuster hit “Ode to My Father,” and Hwang and Yoo Hae-jin from Ryoo’s earlier film “The Unjust.” However, there are also some surprises in store -- model and singer Jang Yoon-ju makes an appearance as the only female detective on Hwang’s team, and Yoo Ah-in, known for his roles as humble and golden-hearted characters despite his bad-boy image, takes on his first wealthy and villainous role. The cast also said that Ryoo’s eye for action will be on full display in the film. Yoo Ah-in said that it was a new kind of action for him because of his character’s prestigious upbringing. “Of course, the fight scenes were very passionate, but it was also stylish, like fighting skills you’d have to pay to learn,” he said. According to Ryoo, the film has a meaningful message at its core, but it is presented in a fun and humorous way. “Just as the best teachers are those who can explain hard concepts in an easy way, I wanted to send an important message through entertainment,” he said. “Veteran” opens in local theaters on Aug. 5.